Florence's Gonfalonieri who carry her great lilied banner, the 'Gonfalone' of Justice, and trumpet fanfares at civic celebrations in Florence. It was a magnificent day, thanks to everyone, the Comune of Florence, our special visitors, Eugenio Giani, President of the Consigilio of Florence, Mary Ellen Countryman, the American Consul, Scott Lewis, President of the Browning Society and of the Friends of Casa Guidi, Michael Meredith of Eton, former President of the Browning Society, Gerardo Kraft, President of the Swiss Evangelical Reformed Church, Edgar Kraft, the Swiss Consul, Sara Milne, Director of the British Institute, Daniel-Claudiu Dumitrescu, President of the Asociatia 'Agrustic Somnacuni'. 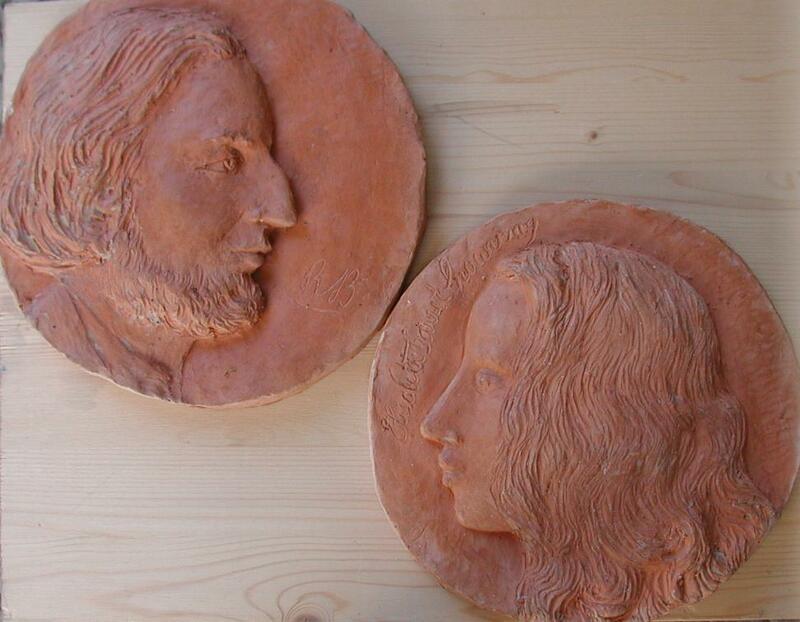 Elizabeth Barrett Browning was accorded the same honours as is Dante Alighieri by the City of Florence! The great wreath of the City of Florence was laid at her tomb to the fanfare of trumpets by the Gonfalonieri, two smaller wreaths by the Browning Society with white roses, by the Friends of Casa Guidi with white lilies, all of which replicated the wreaths at her funeral 150 years ago. The many guests could browse the offerings of the Book Fair to raise funds for the restoration of Odoardo Fantacchiotti's statue of 'La Speranza', enjoy the refreshments offered by the Swiss Church, and view the exhibition of books associated with EBB and her circle of friends, particularly of those who attended her funeral, the Hiram Powers family, the William Wetmore Story family, Kate Field, Isa Blagden, Robert Lytton, the Cottrells, etc. I gave two guided tours, the first in English, the second in Italian, in which I spoke of our anti-slavery Abolitionists, how Frances Trollope wrote the first anti-slavery novel, Richard Hildreth, the second, both buried with us, Harriet Beecher Stowe copying them with Uncle Tom's Cabin, which was immediately translated into Romanian and that this freed the Roma from their slavery which lasted from the Middle Ages to the nineteenth century, longer than were Blacks enslaved in the Americas, and how it is the Romanian Roma who have restored this Swiss-owned, so-called 'English' Cemetery, where English, Swiss, Americans, Russians, Romanians, Poles, Hungarians, Scandinavians and many others, Protestant, Orthodox and now Catholic, lie peacefully side by side. A vision of the future. Gonfalonieri at EBB's Tomb. In the background to the left top one can see how filthy the beautiful statue by Odoardo Fantacchiotti of 'Hope', 'Speranza', now is. Click on photo to enlarge. CNR came that very afternoon to start work on her restoration and cleaning. Gonfalonieri with Aurelia Bartholini, Katerine Gaja to the left. I also spoke of the need to raise funds for the restoration of Odoardo Fantacchiotti's very beautiful but now very dirty 'La Speranza', as an allegory for Florence, for Europe, for the world. For this purpose I gave my publications and limited edition productions for the 'Book Fair', which raised €300 of the needed €10,000. Other donations we seek, roses, especially standard roses as there once had been an avenue of these on both sides of the main path, and other plants with non-invasive roots that do well in Florentine sunlight and soil. Gonfalonieri, Tomb of Thomas Southwood Smith. We shared Elizabeth Barrett Browning's Casa Guidi Windows in English and Italian, for I found on the Web in a Roman bookshop an 1851 translation into Italian which we have now republished it with facing page, English and Italian, in the same way we publish her Sonnets from the Portuguese, William Morris type, handbound with our marbled paper.